This 1-piece solid wood grill scraper in a handle design is the perfect bbq cleaning tool and gift for the budding pitmaster! It's an all-natural alternative to nylon bristle and wire brushes. The nylon and wire types have a potential to fall apart, leaving trace bristles on the grill that could end up in your food. This wood scraper will form to the shape of your grill's grates and provide a safe and effective cleaning to your bbq grill. Each wood scraper is coated with food-safe mineral oil. Doubles as a hotplate, cutting board, and serving tray. 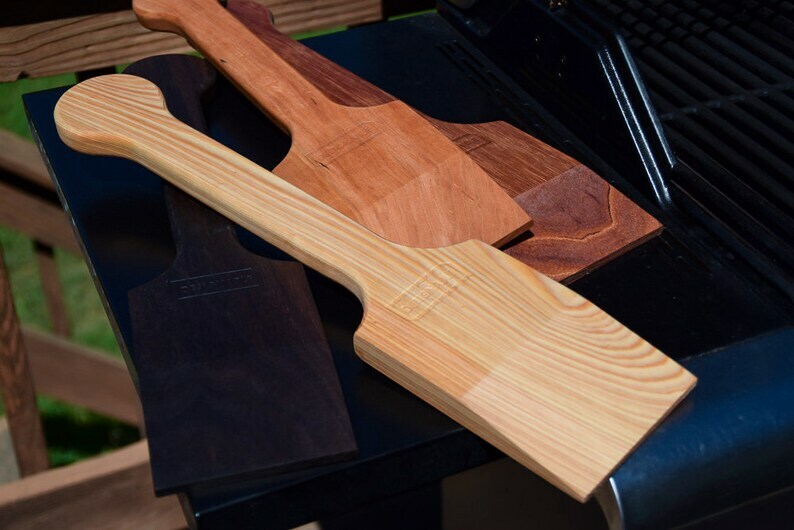 Size: 18" x 4" x 3/4"
(species in order of pictured (2-6): sapele, maple, cherry, cypress, spanish cedar) wood grain will vary from what is pictured. > > shipping fee overage can be refunded if a Flat Rate USPS package works out to be cheaper based on destination. Start by getting your grill up to high heat. To form the grooves, you push the scraper back and forth along the hot grates using a slow firm pressure. A 45-60 degree angle is most effective and keeps your body away from flames. It could take a few minutes depending upon wood species (harder may take longer). Nice design and quality construction! I would definitely purchase from this store again. perfect! well made + super fast shipping. We use PayPal and Direct Checkout to process credit card payments: i.e. visa, mastercard, amex (you do not need a PayPal account to pay your order). Payment in full is due before the item is prepared for shipment. We allow a 24 hour window (from time of order) to cancel any order. Once packaging has begun, any cancellations will incur a cancellation fee in the amount of $7. CT residents will add 6.35% sales tax. BUYERS: Etsy requires an account to make purchases. If you'd rather not do that just contact us - andrew [!at] designablemakes.com - and we'll sort it out another way. All Sales Are Final. Because of the natural characteristics of the materials being used (and the mixing of different species) in the construction of items and the timeframe involved in building items to their eventual sale and shipment, we cannot guarantee them. We visually inspect all items before they are shipped and will notify the buyer of any issues that may warrant a canceled sale. We are very personable and want our patrons to be happy with the items they've purchased from us - It is at our discretion if a reduced cost adjustment may be applicable. Wood is a natural product that will continue to see movement (expansion, contraction) throughout its existence. Cracks, warping, cupping and any other characteristics are deemed a natural occurrence of the wood fibers and cannot be controlled or prevented completely. Proper care (on the user’s part) must be taken to maintain a stable environment - temperature, humidity, and exposure to liquids play a huge part in how the wood reacts to its environment. There may be discrepancies in color from what is being viewed on the computer to what is actually delivered. We take care to provide the correct lighting and color representation of all images presented, but wood will naturally darken with age. Blemishes are also characteristic of wood and may or may not be left in for aesthetic reasons. This policy applies to all items, including custom orders (especially items with a customers monogram/name). Feel free to contact us with any questions before making a purchase, or to get specifically detailed pics of an item you're interested in. ** If an item arrives damaged from shipping (package is torn/crushed/wet/etc., please contact us immediately, as USPS has a short window of time to make a claim, and we'll get a remedy in the works. We ship items insured, with delivery confirmation to the continental U.S. We may ship via UPS, USPS, and FedEx (larger items may be by freight). Orders will be shipped out within 2 business days of receipt of payment (to also allow a cancellation window). Once item ships it cannot be canceled. If your item ships flat-rate, you may receive a refund of shipping on an order if it exceeds the flat-rate amount (minus any additional insurance cost over the $50 included with flat-rate). Item designs will vary. They may see limited use (to determine adequate function, usability and longevity) before being offered for sale. Ask us about building a custom item, or modifying an existing item.